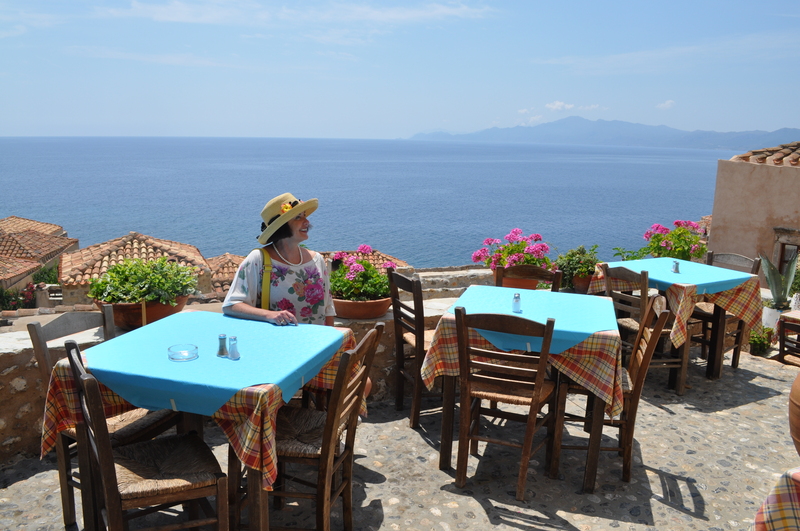 Now I am willing to bet that when you think of Greece the town of Monemvasia is not one that instantly springs to mind. My thoughts exactly so I had to do some research to find out where it is located and why our cruise would stop there. So here we go in a nutshell – founded in 583 by Greeks fleeing the mainland from the Slavic invasion – a walled town with a formidable fortress which withstood the Arab and the Norman invasions – nicknamed the Gibraltar of the East – today restored with loving care and a draw for travellers seeking a unique and historic destination. We were lucky being the only ship visiting there and took the tender ashore not really seeing the town at all but just the church and fort at the top of the hill. However a short walk around the hill drew gasps of astonishment from just about everybody. There sat this beautiful walled city with the original narrow winding streets nestled into the side of the mountain and set against the blue of the sea. Every corner we turned was a delightful surprise of tiny little shops full of hand crafted pottery or paintings, small restaurants with verandas jutting out over the sea and small boutique hotels. No cars or bikes were allowed past the main town gateway and all the luggage for the hotels was delivered by hand-cart. All that exercise and a Mediterranean diet to boot – no wonder these people live so long! 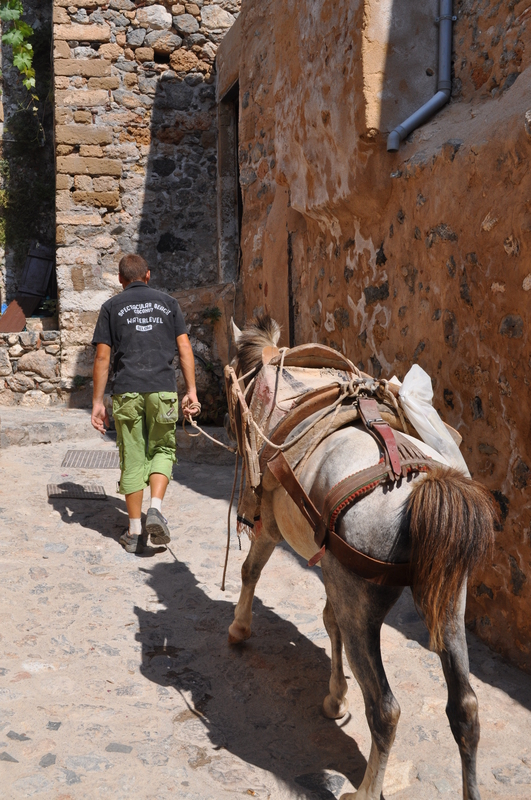 Heavier deliveries were made by way of donkeys carrying two panniers – no easy task going either steeply uphill or downhill on cobblestones polished to a shine by years of wear. Here the beach is the typically pebbly type found so often in the Med but we noticed several little restaurants set up right on the beach with tables and chairs. 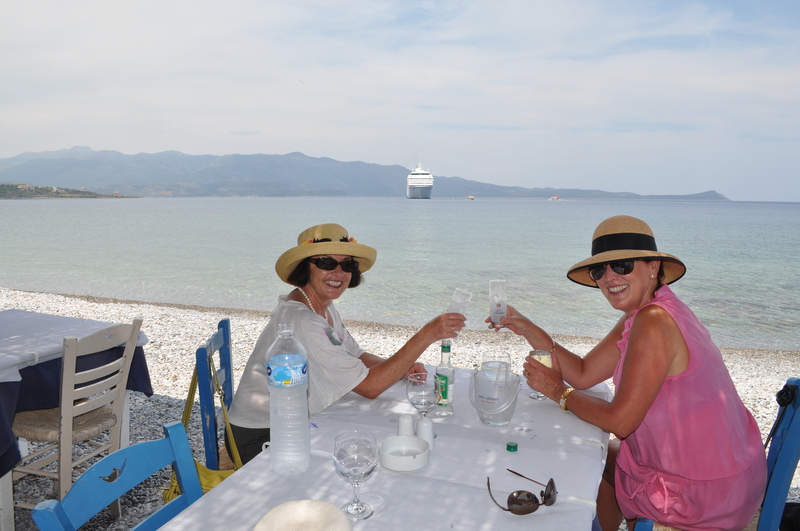 I had a sudden urge to do a Shirley Valentine and sit at a table on the beach in Greece with a glass of wine. So I did just that. What a satisfying moment. I didn’t suddenly change my life or stay and get a job there as a waitress ….. but I might have. It was touch and go. Hey Shirley - come on over!